Once upon a time there lived a free spirited woman named Yve. She liked to twirl through the rain storms, make whistles out of the greenest blades of grass, and touch everything that caught her eye. Yve often sang at the top of her lungs as she walked down the street and had the best conversations with the brick wall inside the newspaper foyer. People didn’t quite know how to handle Yve as she was a bit strange, but she hardly noticed the odd looks or raised eyebrows. Yve was happy in her own small life of no significance to anyone, but herself. One day Yve was walking through a part of town that was completely unfamiliar to her. She had stopped for a scoop of her favorite coconut ice cream, but as soon as she stepped out of the ice cream parlor the delicious ice cream began to melt pouring over the side of the cone and down her arms faster than she could stop it. She became so preoccupied with the sticky mess she didn’t pay attention to where she was going and managed to find a street that was entirely new to her. The street was narrow and dark though the sun burned brightly overhead. Yve finished off the last of her ice cream cone as she came to the front of a little shop nearly hidden in the dense brick walls. 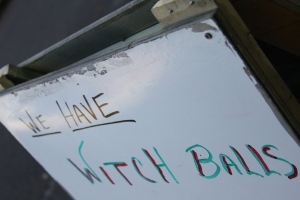 If it were not for the sign stating the shop carried witch balls she would have missed it all together. Yve hoped they would have a restroom where she could wash her hands and she was terribly curious about what a witch ball was. The dull klong of the door chime and the blast of frigid air as she walked into the shop made goose bumps cover her flesh. It was a wonderfully, strange place. Mismatched shelves covered the walls. Each shelf held mysterious glass jars filled with strange looking spices or twigs or leaves. One shelf in particular caught Yve’s attention. It was the only shelf with doors closing its contents from the view of the public. Yve meandered her way towards the shelf need to see what was on it. When she reached the checkout counter she called out in her sing –song voice. There was no reply so Yve walked around the counter laying her hands upon the peeling green paint of the old cabinet. She looked left then right. No one was her this was her opportunity. She opened the cabinet to find the top shelf contained jars of bird feet, reptiles, and eyes. Her nose crinkled at the sight. The next shelf had the most wonderful glass balls. They swirled and sparkled enticingly. Yve licked her lips and took another look around the store. She wanted to feel the ball to see if it was as light and airy as it looked. She wanted to feel the smooth surface beneath her hands and feel the coolness of the glass. If she was extra careful with it what could it hurt? Yve studied each of them finally decided on the pale robin egg blue ball with swirls of purple. Her hand closed around it and Yve felt a tug in the center of her stomach. Moral of the story don’t touch someone else’s balls without permission. Uh oh...is Yve going to get blue balls? LOL cute, Liz! Hehehe... What a funny little story! lol... A good lesson, to be sure... lol I love it, Liz. For your author bio in the right-hand side, it should read: "Does it really matter? Can't you see I'm hot stuff? Just read my blog, stupid."